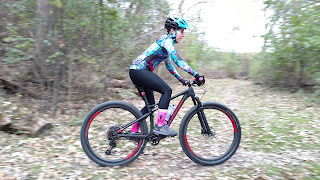 I'm back with another "non-pro" review on a new bike that I've had a couple rides on: the 2018 Specialized Women's S-Works Epic. If I'm lucky, I'll be able to get out on this bike one more time before the dry season officially ends. 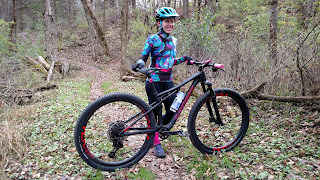 If I'm not, I had 2 excellent experiences on this bike and will count down the days to where I can take my Specialized Women's S-Works Epic on the trails again. I'll report back with a second review in 2018. 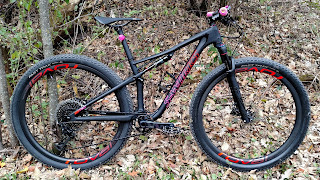 This is my second race-style full suspension, we made the decision to purchase the new Women's S-Works for a couple reasons. Reason #1- We are no longer Salsa dealers, thus my current race bike isn't a brand we sell and it seemed like I should be on a brand that we sell when I'm doing mountain bike races or posting to social media. It's a bittersweet move because I love my Spearfish, yet it's representing a brand we can't bring in- and being (basically) a co-owner of a bike shop, I should be on a shop brand. Reason #4- I like 29" wheels. I'm 5'2". Between the two brands we carry in store: Trek & Specialized, I would not have a 29" wheel size with Trek. Trek would put me on 27.5" wheels. Specialized still gives me the option of going with a 29" wheel. Why do I like 29" wheels better on full squish? Because I do. I don't feel I have many issues at all with handling a 29" wheel. I like my Trek Procaliber 9.8 with 27.5" wheels very much, but something about the taller wheel size and suspension makes me more inclined to take the bike elsewhere. I feel more stable, secure, and confident. 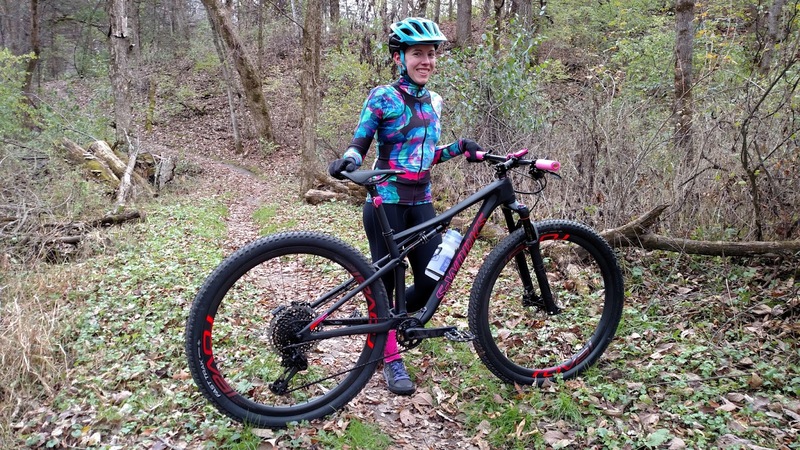 I'm going to do the same for this review like I did with the Trek Farley 9.8- I'm not going to nerd out on all of the geometry specs and such. You can find all of that information elsewhere. With a few changes to the bike, like a different seat & grips. We added a computer, TOGS, and HT pedals. We also swapped the seatpost for one that accepts my preferred saddle (Bontrager Ajna). We changed the stem to make the reach exactly the same as my Spearfish. Current weight is about 21.8 lbs or so (I never wrote it down when we weighed it-) by next season this bike may have different wheels and grips and the assumption would be that would lessen the weight. The weight of my Spearfish for comparison: 23.17 lbs. Getting the air pressure dialed in with both the front and rear suspension was simple. We put the rear shock setting on medium to start with. Front Tire: Fast Trak, GRIPTON compound, 2Bliss Ready, 29 x 2.3"
Rear Tire: Fast Trak, GRIPTON compound, 2Bliss Ready, 29 x 2.1"
Hand-built, featherweight Roval Control SL carbon fiber wheels. My first ride on this bike was not a "put it thru the paces" ride as I was needing to burn the brakes in. We took the opportunity to grab some snapshots of the bike, too, as I thought it might be the only ride I'd get on it. First initial impressions- the fit and feel of the bike was very comfortable. Standover wasn't an issue. I wasn't as bothered by the rear shock as I thought I would be. Everyone talks about the "stutter" from the Brain, and I was under the impression I'd possibly hate it. On the medium setting it didn't seem so bad, barely noticed it. I did play around with the rear suspension settings to see how full, firm, or medium felt. I would say that for me, the medium setting takes the cake for me at this time. I had my front suspension set more in the middle vs. fully on. The handling of the bike didn't seem awkward, usually, when I ride a new bike I have moments of "relationship building" and this time it seemed very natural. I liked that a lot. In reality, the second ride is more important than the first...so let's jump to that. 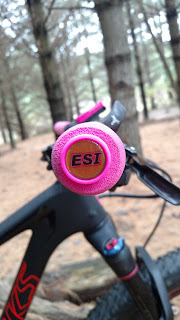 It had rained that Thursday morning, so I wasn't sure if I'd ride the Epic or not. I deduced I should give the tires a spin in somewhat greasy conditions because that's what Time Trials more than likely is. 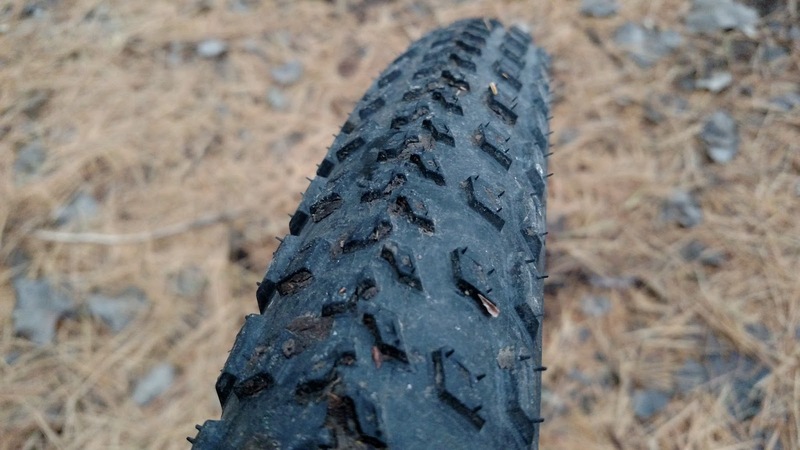 I rode Bontrager Team Issue XR2 tires all this season, but was curious on the Fast Trak tires- they seemed somewhat similar. 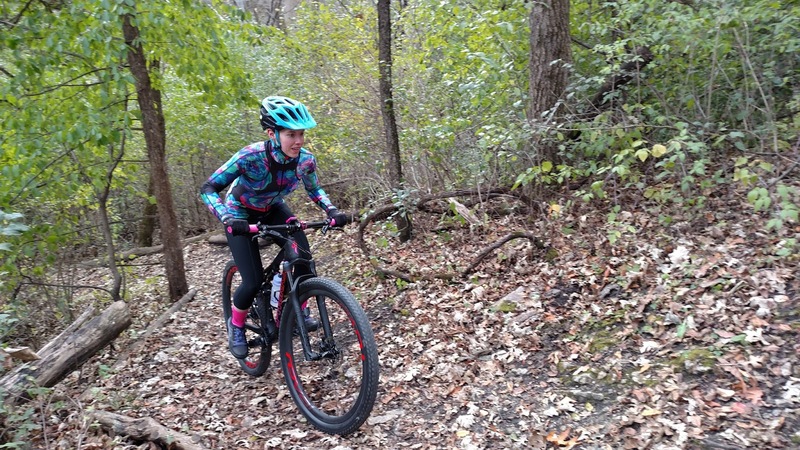 This time, I put the bike thru the paces for as well as I could given the conditions. 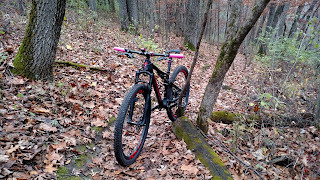 Wet and leafy trails aren't something I desire to ride fast, but I found it way too easy to get up and go with the Epic! #1. Climbing was great. I made it up some steeper/more tricky climbs without issue. #2. Tires worked very well for the conditions. I was running about 18 psi front and rear- few times I spun on a root, but I never lost traction to the degree of having to put a foot down or stop. #3. I felt like it had a lot of easy-foward momentum. I'm not sure if it's the weight of the bike, the wheels, or the front chainring size...it was excellent! #5. I put my front suspension fully open this time. I'm not sure if it was the suspension, grips, or a combo of both- but my hands were not as sore/numb as they get on some rides. That was a treat. #6. Cornering felt great. Overall my feeling of stability on the bike was top notch. #7. Rear suspension on medium setting- didn't really notice it nor felt it was awkward or an issue. It's not the same as the Spearfish, but it definitely makes for an efficient bike for climbing hills, which Decorah has plenty of! I'm a "set it and forget it" type of rider, so I'm usually not fiddling with suspension settings on my bikes. The front fork is always on unless I'm on pavement...with the Spearfish I normally left the rear suspension on "Trail" for that happy medium feeling. With two rides, I can say with certainty that I love this bike. I also, almost, hit a deer. Yes, I'm totally not joking! I came up out of a little "dip" in the trail and when I came up a deer had been on the side of the trail probably having supper or something. It saw me, turned around, and ran in front of me. It was faster than my by just enough for me to not literally ram my bike into its hindquarters. I had a real "Oh $#*!" moment wondering what I'd do if I hit the deer...how badly would I get hurt...how broken the bike would be. 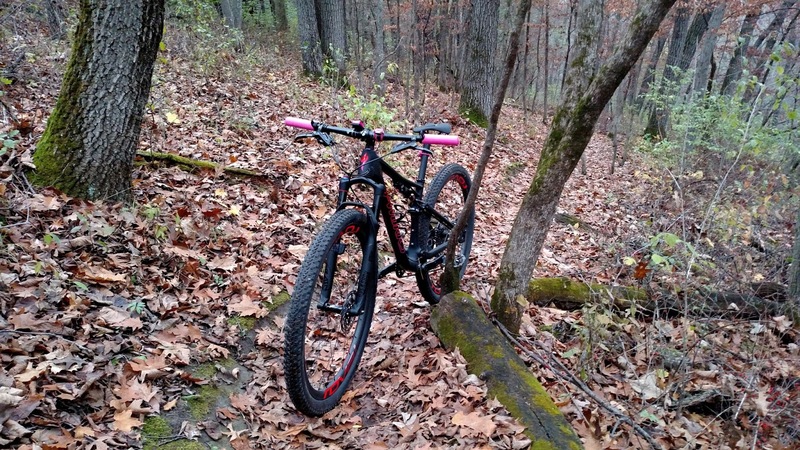 This bike makes you almost as fast as a deer running away from mountain bikers! Stephen McNasty...but Stephen is pronounced like "Stefan" ...I kinda like to make up my own rules. All in all, we have for you BEASTFACE Squared...and this bike is a beast. I haven't felt quite like this since I first hammered down on Gaston in the pines and thought "This bike is badass!" Yup. This bike IS badass. 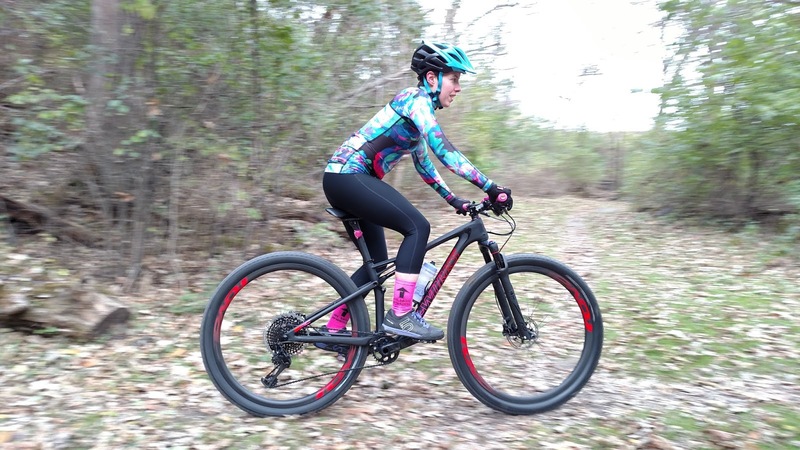 For folks looking to get in on some Epic goodness, they do have Comp Carbon and Alloy versions of the women's Epic available. You can look at the men's lineup too- the difference is touch points (grips/saddle) and not having the suspension tuned for smaller riders. Personally, I am appreciating the tuned suspension. Keep in mind, my desire to try this bike out was strong enough that if I wasn't able to get the Women's S-Works Epic, I would've gotten a men's complete bike or frameset. The frames are EXACTLY the same regardless if you choose the men's or women's option. Most folks change saddles and grips to their preference- I've also ridden suspension setups not tuned to smaller riders without issue. You have great looking options with looking at the men's lineup with some sweet color options! If you're hankering for carbon, you have 3 options to choose from: Pro, Expert, and Comp Carbon. 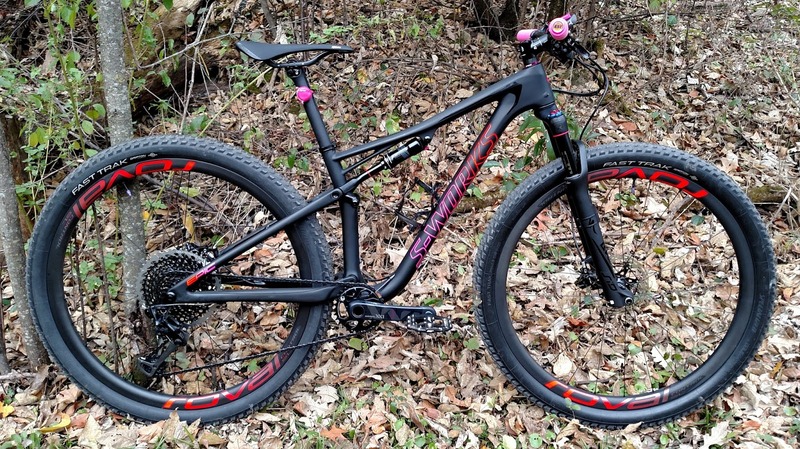 Again, the difference is the Women's Epic has suspension tuned for smaller riders- this does not mean that a smaller male couldn't rock this bike. 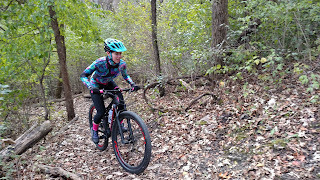 In the alloy versions of the women's option, you have smaller frame sizes available, unfortunately, there isn't an XS option in the men's frameset or complete bike. Without a doubt, I'm completely sold on the Epic, and I can't wait to continue hitting the trails with it! 2018 should be a rad biking year! I'm so bummed....have had a bike on order since July and still not able to get the S-works in a small. Looks awesome though! Major bummer! I honestly had no idea if I had gotten my pre-order in soon enough to get one or not. It was a real nail-biter!